A scientific experiment begins, and as the button is pressed, the unexpected occurs: everyone in the world goes to sleep for a few moments while everyone's consciousness is catapulted more than 20 years into the future. At the end of those moments, when the world reawakens, all human life is transformed by foreknowledge. 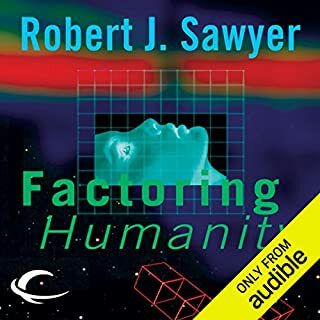 ©1999 Robert J. Sawyer (P)2008 Blackstone Audio, Inc.
You know how you sometimes wish you did something different after some event has happened.. well Robert J. Sawyer explores this here. Based around a group of scientists who are conducting an experiment at CERN (the place where they have a massive collider running thats SO large it spans 3 different boarders/countries) in Switzerland. The results are not as they expect..
What would be your path in life if.. for 2 mins, you could see 20 years in to the future.. would you be with that person you thought you loved? If not, how would that affect you today... with that person you're with now... hhmm.. how does fore knowledge affect your daily decisions in life?? As with his other books - the science behind his stories are not outrageous, indeed they are scientifically sound (reference to SCI-FI weekly). Enjoy it, its a great story.. If you enjoyed this I would recommend one of his other books: Terminal Experiment. I like this kind of science-fiction and this was right up my alley! I was hooked on the TV series when it aired in 2009 / 2010 and was left dangling at the end when it was abruptly cancelled. The last episode of the show was shot before it was known it would be cancelled; it depicted a second Fast Forward Event happening 20 years in the future… and then it was over! What a tease! I didn’t realize at the time that the show was based on a book so I was excited to discover it and finally get some closure. Loved it! First of all, I must preface these comments by stating up front that I'm not a big science fiction fan. I do find the concept of time travel interesting so reading a synopsis and the fact that it was on sale drew me in. The premise, that during a scientific phenomenon, the entire world sees 21 years into the future was interesting. I thought, "How could a 2 minute glimpse of the future seriously effect the lives of today?" I suppose that is what grabbed me and the mental processes that go through everyone's mind as a result intrigued me. I listened to this one and found myself looking for excuses to get away from everyone so I could find out what happened next. The science portion of this book, which is actually relatively small, interested me much less than the human aspect. The end had a few bizarre twists that made me roll my eyes, but on the whole I enjoyed the read. Little character development, flat one dimensional characters that live in their heads, with internal dialogues to deliver "the message"
The idea for this story is intriguing and it starts off well and has some good suspense. Sawyer explores some interesting scenarios through the lives of the characters overall, yet toward the end, it just doesn't feel that well thought out. I feel like maybe the author was under a deadline or something and just put a generic component to the ending. This wouldn't be at the top of my recommendation list, but it is worth getting if you really love time travel fantasy. 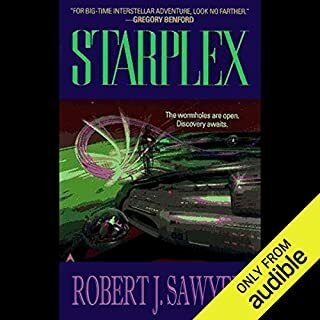 The best time travel stuff on Audible that I have read is definitely Replay by Ken Grimwood, The Schumann Frequency & The First Boxer by Chris Ride and 11-22-63 by Stephen King. Hope this helps. Later. A Hadron collider experiment causes the collective consciousness of humanity to get a glimpse of the future 21 years hence for about 2 minutes. The book is filled with the consequences, as well as interesting asides, scientific explanations, a little romance and a fair amount of action. It was an easy read and an enjoyable one. It was more thoughtful and reflective than one might expect with such a plot, and Sawyer is a romantic at heart, which slows down the ending. The narrator was good, almost invisible to the telling, so you could just concentrate on Sawyer's words. This book was spectacular. I enjoy hard SF, especially stories that begin in contemporary times, and this book did not let me down. Sawyer does a great job at mixing murder mystery with the skiffy (sci-fi) foundation. Only 52 minutes left and I'm finding it hard to finish. I went through The Rise and Fall of the Third Reich (57 hours) in less than a week but this 10 1/2 hour book just doesn't do it. It might help if you have a smattering of physics - but if you do- it's great! what would you do if you knew a snippet of the future - could you/would you change it? Excellent storyline, well read, good pace. I love SF that is possible. I was looking forward to listening to this book; it had attracted quite a few plaudits and the basic premise was an intriguing one. However, after a reasonably promising start, the book disappoints. The author does not seem to have the imagination to develop his ideas properly, and the characters and their relationships are just too formulaic to carry the plot and maintain the narrative momentum. As a result the book meanders around in the middle part and whilst it picks up a bit towards the end, the ending itself is laughably cliche. Nor does the narration save the book - too one paced and earnest with the various characters not adequately distinguished. As I said, disappointing: save your money. The concept of the novel is great - an experiment at a particle accelerator produces a glimpse of 21 years into the future for the whole of humanity. The book follows the story of the scientists as they attempt to work out what happened and follows the debate over whether the future is fixed or can be changed. One strand of the story follows a character as he tries to find out what happened in his life that meant his future self is not around in 21 years time. For the most part the book is enjoyable and engaging and kept me coming back for more. The last third of the book ties up some of the loose ends but takes an odd direction for one of the characters and I didn't buy in to the end of his story. Overall though I enjoyed the book and found it a real page turner. I'm glad I've read, listened to this book. Totally different from the TV series of a few years ago. A good story although there was much sciencespeak. it was interesting to hear how the world would look in the future and even when you "see" your possible future, you could be in the wrong place at the right time. 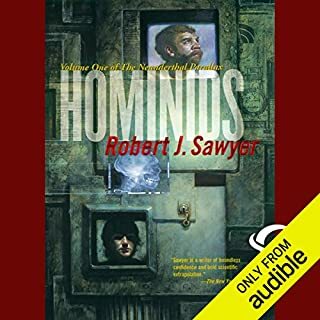 I really enjoyed this book, the reader is very easy to listen to, and really brings the characters to life. The first half of the book is the best as they deal with 'the event' but it does get rather far fetched towards the end, especially for a book which grounds itself as much as possible in believable physics. But don't let that put you off, it's still a great book! The book was written in 1999 and is set in 2009, so although the setting is now in the past it was still a decade in the future when it was written, so it's interesting to note some aspects like the author suggesting that book stores had all turned into coffee shops with 'print on demand' facilities. One of the characters in 2009 expressed amazement at a 2030 vision of hard drive based recorders for TV programmes when they are/were perfectly commonplace in 2009! Also while this takes some common elements from the TV series of the same name, the story is completely different so having watched/read one is not going to spoil the other! 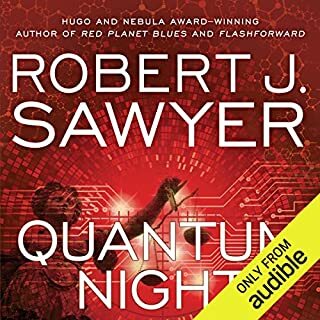 This is the first book I have read by Sawyer and it is a must read for SciFi fans. I wish I listened to this before seeing the TV series's however it was the series that introduced me to his work. I have had this book in my wish list for a few years and finally got it, I loved he twists and turns and the solid science. He paints seems of place that I have been to with detail that really brought them to life. So much of the book feels solid and realistic that it absorbs you the way a really good story should. Every time I stopped I could not wait to get back to the book. What did you like most about Flashforward? The thing I liked most about this title is the well written story and the relatable characters. Lloyd, the leading man if you like, is my favourite character. He has his flash forward/vision, and he has a bit of a tough time explaining what he saw to his partner. Mark Deakins performance is great. Reads at a good pace and has a very clear voice. His voice changes for the different characters. There are characters from a few different countries, and Deakins handles the different accents very well. He even say a few French and German phrases. I filled up a little when a characters child dies. During the chapters following the death they are having a hard time and the way she is written is very true to life. Overall a great listen. Kept me engaged from the off right until the end. If you knew the future would you read this book? 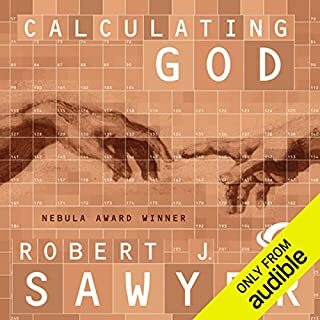 Yes but not unreservedly, Robert Sawyer writes very intellectually interesting books with great ideas and he writes them well. Sometimes though what he brings in terms of the ideas and the philosophy he looses in the emotional translation. If you love ideas, this book is a marvel, if you need emotions with that its a good book, If you want an emotional book its a waste of time. Great characterisations, he got everything he could from the page and was very clear. Absolutely not, its way too theory heavy, but 2+hrs would be ok.
Its a great book for soft sci-fi lovers who want ideas heavy books. Yes. 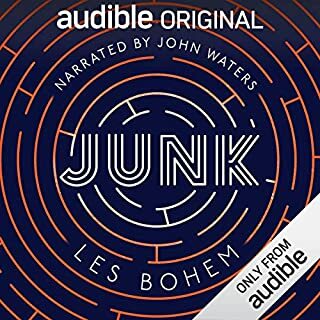 Fantastic concept and unique story which keeps the listener guessing. I loved the exploration of different scientific models and the characters desperately trying to make sense of it all. The science chats in the lunch room where they they explain and denounce theories. 10 hours is a bit long for one sitting but it could be done. Strong beginning but unfortunately the build up is better than the ending and the listener is left with a sense of anti climax. I thought the build up was strong enough to make this a good book and a must listen if you like science. An excellent, thought provoking story, with a different feel to the TV series. For two minutes, everyone loses conciousness, and glimpses their own futures. Of course there are many deaths caused by the two minutes, the one thing better portrayed in the TV series. The focus here though is how to deal with your glimpse of your future self - relationships had changed, and some see no future at all. Questions are raised - if you see your future, for example, is it therefore impossible to commit suicide? If the future is set, do we have no free will or control? Will definitely be up for a re-read. After the TV show was cancelled years ago I finally got a chance to get closure on the FLASH FORWARD events. Kept me entertained on my commute to and fro work and with enough distractions going on in the real world this was a great escape which is why I gave it 4/5 rating. Dislike - my personal opinion ending could've been better it's a bit harsh but like the movie INTERSTELLAR it had me all the way up until that last bit which left a slightly funky taste in my mouth. Just me I know but not a fan of these out there endings. 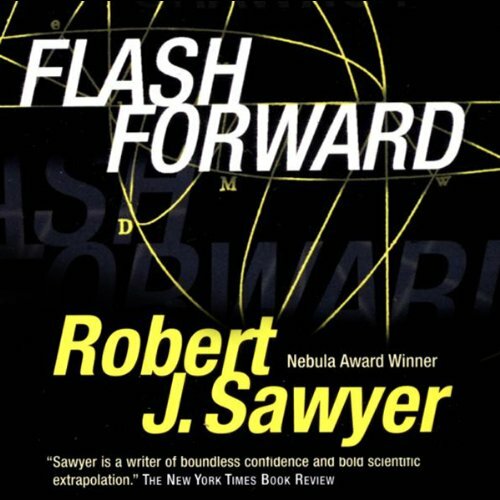 I liked the idea of "Flash Forward" but the scientific theory did not get me engaged. I love my Sci-fi and a good "time travel" idea but this did leave me disappointed. The scientific explanations should have been dialled back. Some are helpful, but I felt there was too much in this novel and it became frustrating. With an audio book you listen to every word. You don't skip past in case there is some important information key to the storyline so you slog through. The narrator does a great job with some amazingly complicated terms, names and foreign languages. I got to the end though and went, "Really, that's it?" It had some good moments, interesting concepts and left you thinking about many things, but I did feel let down by the conclusion.